More than a dozen students studying the languages of Southeast Asia at NIU have big-time reason to celebrate this spring. 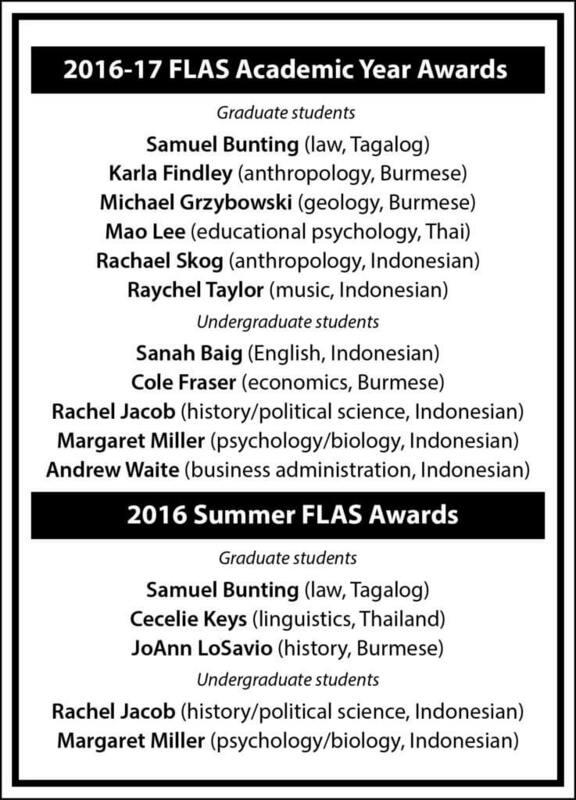 The students have been awarded Foreign Language and Area Studies (FLAS) Fellowships. And suffice it to say, the scholarships are substantial. Five undergrads and six graduate students won the fellowships for the 2016-17 school year, covering their NIU tuition, student fees and insurance. On top of that, each student will receive stipends over 10 months that total $5,000 for undergrads and $15,000 for graduate students. Additionally, five students received Summer FLAS Fellowships, covering tuition for the study of Southeast Asia languages at institutions across the globe this summer, including in Indonesia, Thailand and the Philippines. Each student also will receive a $2,500 stipend to help with travel expenses. NIU’s Center for Southeast Asian Studies selects a new crop of FLAS Fellowship recipients from a pool of applicants each spring. The latest round of awards has a total value of more than $300,000. “My parents are ecstatic because (the FLAS program) basically paid for everything,” says Rachel Jacob, a sophomore from Long Grove double majoring in history and political science, with a minor in Southeast Asian Studies. Jacob is studying the Indonesian language and has her sights set on becoming an international human rights attorney. She received both the academic-year and summer FLAS awards. 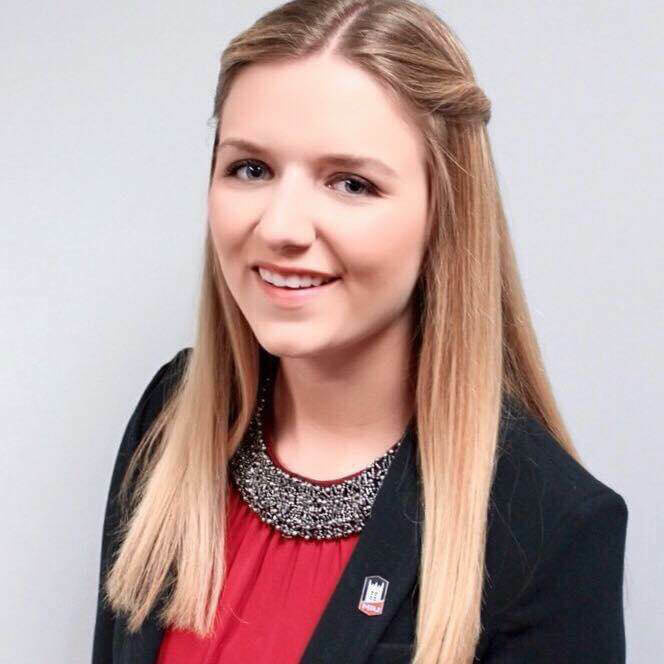 Later this month, she and NIU sophomore Margaret Miller, who is majoring in psychology and biology, will travel to Indonesia to study at a prestigious language school in Yogyakarta, a city known for its cultural heritage and 18th century Sultan’s Palace. “I feel like my hard work has paid off,” Jacob says, adding that one of her political science professors, Kheang Un, encouraged her to apply. “The fact that I’m able to get financial support to study a language and culture that I’m passionate about makes it even more rewarding. NIU is one of seven universities nationwide designated as a National Resource Center for Southeast Asian Studies. As such, the center receives federal funding for the FLAS Fellowships, with the NIU Graduate School kicking in tuition waivers to further stretch those scholarship dollars. Students must have completed or be in the process of completing one year of training in a Southeast Asian language to apply for a FLAS Fellowship. NIU offers instruction in five Southeast Asian languages: Burmese, Indonesian, Khmer (Cambodian), Tagalog (Filipino) and Thai. “Ambitious, internationally-oriented students who are curious about other cultures and languages should have the FLAS Fellowship on their radars,” says NIU history professor Eric Jones, who oversees the program for the Center for Southeast Asian Studies. 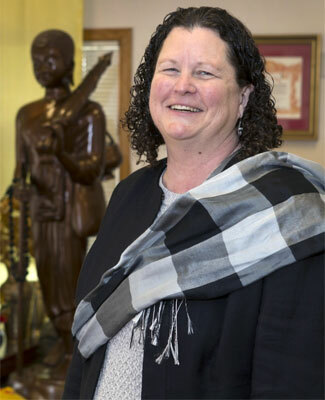 Anthropology professor Judy Ledgerwood, director of the Center for Southeast Asian Studies, points out that alumni of the fellowship program at NIU include Congresswoman Tammy Duckworth and others who now live in Southeast Asia and work in business, academia or non-profit organizations there. Within university area studies programs, FLAS Fellowships are well known and prestigious. 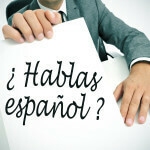 But students who are searching for a major or considering language studies may be unaware of the opportunities. Fortunately, Waite knew about the FLAS award before he ever stepped foot on campus—thanks to his older sister Elise. She is an NIU senior majoring in environmental studies and a two-time FLAS Fellow. Now with his latest award, Andrew Waite has already earned three FLAS awards. “For our family, it has meant an affordable education and opportunities to do what we love—and that is to travel the world,” says Waite, who studied in Indonesia last summer and was a Rotary exchange student in Indonesia as a high school senior. He believes his minor in Southeast Asian Studies and mastery of the Indonesian language will give him a leg up in the business world. Indonesia is a developing country with the world’s fourth largest population. Sometimes, the world lands on our doorsteps, however. It was Karla Findley’s volunteer work with Karen Burmese refugees in Aurora that led her to the Center for Southeast Asian Studies—and eventually to three FLAS Fellowship awards. The Karen people, a minority group from Burma, officially known as Myanmar, have been in an intermittent state of armed conflict with the country’s dominant majority since 1947. A decade ago, thousands of Karen families began leaving refugee camps to resettle in the United States, and a considerable number have settled in northern Illinois. Through the World Relief Organization, Findley volunteered to work with the refugees—first helping to tutor a high school student, then working with the boy’s family, then working with other refugee families. 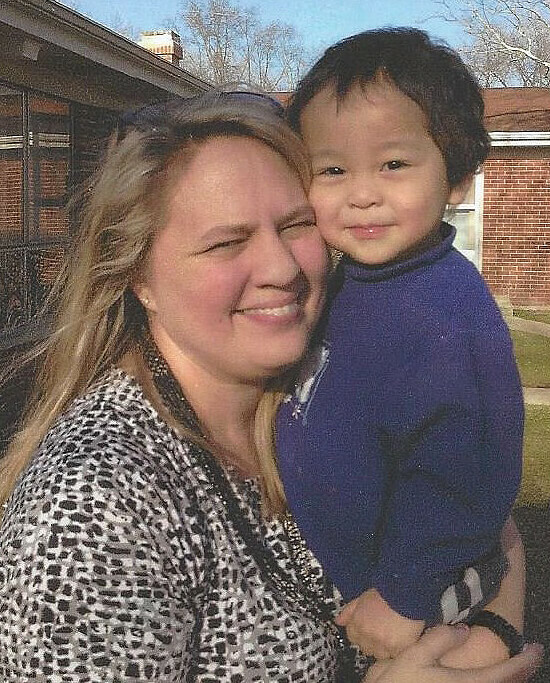 Karla Findley is working with Karen Burmese refugees in Aurora. “I saw them trying to negotiate that transition to America, while also trying to hold on to their culture, and I wanted to help them,” says Findley, a Batavia mother of three children who are in high school and college. 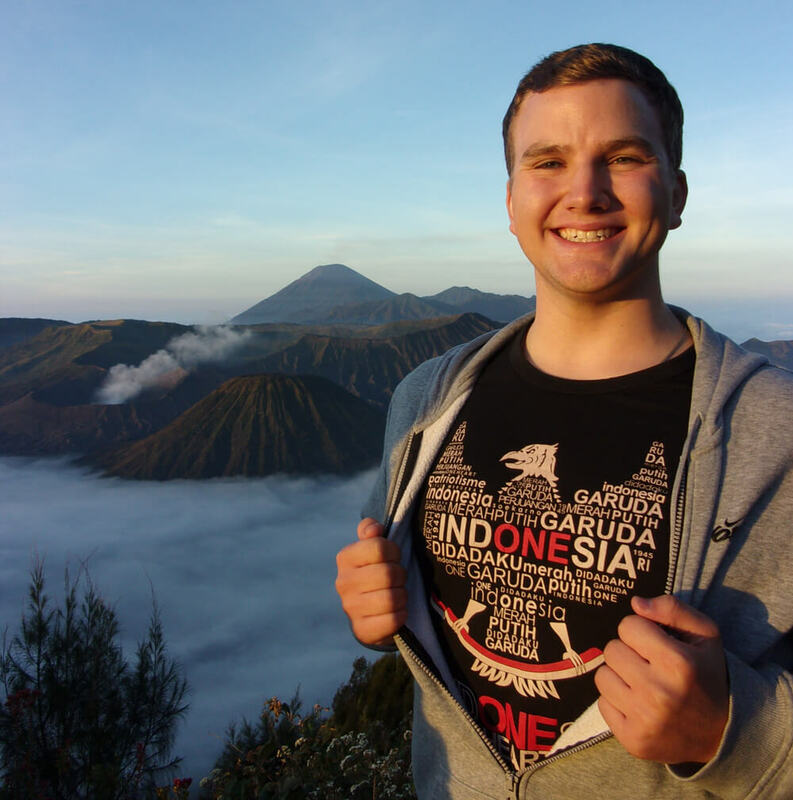 An acquaintance told Findley, who already had a degree in biology, about NIU’s expertise in Southeast Asia. Findley reached out to the NIU center and began pursuing a master’s degree in anthropology. She traveled to Burma on a FLAS fellowship last summer to study the language and meet with Karen communities there. Now Findley has won her third FLAS fellowship, this one for the coming academic year. For her master’s thesis, she is collecting oral histories of the Karen refugees in Aurora to document their experiences. The histories will be part of the Pick Museum of Anthropology’s exhibition on the Karen people in the fall of 2017. “With three kids and two in college, there is no way I could have afforded to do all of this without the FLAS fellowships,” Findley says. “It has been a huge blessing. “I’ve learned a lot about Southeast Asian politics and history,” she adds. “My studies and travels have broadened my worldview, I have a deeper understanding of the Karen people, and I also see the bigger picture regarding the plight of other refugees.